Prepositions can be described as the word that shows the direction and position of an object or person. Across and through are two most bewildering prepositions which can also be used as an adverb. Basically, they refer to the movement from one side to the other. Across, as the name suggests, it is used to talk about the transverse movement of a person or object. As against, through is used to denote a movement from one side of the passage, towards the other side. She walked through the pool. She walked across the pool. At first instance, the two sentences often appear the same to us, but if you check their literal meaning, then you will understand the real difference between these two. In the first example, the word ‘through’ means by way of, whereas in the second example ‘across’ means side to side. Meaning Across refers to the movement of someone or something on, at, to or from the other side. Through implies the movement of someone or something from one side to another, in an enclosed space. Usage When the movement takes place in two-dimensional area. When the movement takes place in three-dimensional area. Examples I have seen a sparrow, while walking across the ground. They came through the back door. The medical shop is across the lane. I can see gas flowing through pipe. There is so much rush on the road to walk across. The road led us through bushes. The bridge across the river was demolished last Sunday. The medical shop is across the lane. A new garage has been opened across the bridge. Domino’s opened its outlets across the city. I just came across the article, you have written in the magazine. She has drawn several lines across the paper. Through means getting in from one end and out from the other end. It is the process of movement from one point to another, wherein the moving person or object is “in something”, in essence, the movement takes place in a hollow enclosed area wherein there are limits on top, bottom and sides, such as, long bushes, tunnel, doorway, crowd of people, forest, etc. The hospital will be opened Monday through Saturday. We lost the contract through the carelessness of top-level employees. We placed the order through the mobile application. We have been through your work, it is quite impressive. One must go through the treatment, to cure the disease. As she has been through a bad experience, in marriage, she doesn’t trust people easily. Shael studied through the night, while Raman fell asleep. I heard about your engagement through an acquaintance. I am related to him through our uncles. Across, as the name signifies, it indicates the crosswise, arrangement or movement of something, i.e. from one end or side to the other. On the other hand, the word through refers to in and out of something which is an enclosed space. We use the word ‘across’ when there is a movement in two-dimensional open space, i.e. a field, ground, bridge, road, etc. Conversely, ‘through’ is used when the movement takes place in three-dimensional closed space, i.e. tunnel, doorway, forest, etc. As a preposition, across tells you the position of an object which is on the opposite end or direction, and you need to travel some distance to reach there. As an adverb, through means fully, backward and forward, while as a preposition it means in an out of a place. It can also be used as an adjective, ‘through’ implies completion of something. The dog ran across the garden and then disappeared after some time. That house across the street belongs to my uncle. I came across your profile suddenly. Amar was penalized for driving through a red light. Our car passed through the tunnel. He hit the nail through hammer. 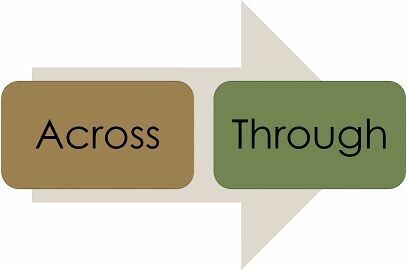 The best way to remember the difference between across and through is that when we discuss, movement from one end to the other, but “in something”, such as a tunnel, window etc. then we use the word ‘through’. However, if space is open through which the object is passing, we use the word ‘across’.